"After all, who better to raise the young prince than the Great Prince himself?" Disney's original film Bambi is one of the most beloved pictures of all time, and thus it could be seen as boldness approaching impudence for modern creators to produce a direct-to-video sequel. But there is plenty to like about this followup, which could equally well be called Bambi: The Hidden Year. The Disney studio wisely kept intact much of what worked well in the original, without too much unnecessary modernization. The film picks up immediately after the death of Bambi's mother (here voiced by Carolyn Hennessy) as young Bambi (Alexander Gould) finds himself alone. The forbidding figure of his father, the Great Prince of the Forest (Patrick Stewart) appears before him. 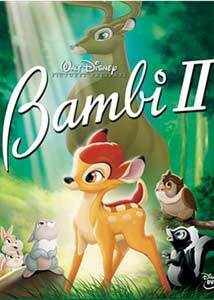 Where the original cuts out to the older Bambi, this film continues and inserts an additional year in the timeline, as the Great Prince instructs Friend Owl (Keith Ferguson) to find a foster mother for Bambi. But while the owl's doing that, the father must care for the fawn himself, unaccustomed as he is to the procedure. The story follows Bambi as he disappoints his father's expectations and attempts to try to deal with his mother's death. Of course Thumper (Brendon Baerg), Flower (Nicky Jones) and Faline (Andrea Bowen) are there to help, while he must also face up to the bullying of young Ronno (Anthony Ghannam) and the ever-present threat of Man and his dogs. The latter points are a significant weakness to the storyline; where the original was content to tell its story the sequel feels compelled to deliver messages about single fatherhood, father-son bonding and facing your fears, making it feel like an amalgam of After School Specials. A certain amount of this would have been quite acceptable, but there are too many competing messages at once making this a little confused in its goals. On the other hand, it does do a good job of giving all of these issues an emotional setting, as the Great Prince first is exasperated in his impatience but comes to love Bambi on a level he didn't believe possible. Bambi's shame and unhappiness are quite painful and may strike quite close to home for many children. The sequences with the dogs are downright terrifying, with hellish red and black coloration contrasting with the cool blues and greens of the forest. What the film does do very successfully is use the character design and style of the original film. Even the expressions that the animals have and styles of movement are a close match, showing the animators really did their homework. The characters hardly seem distinguishable from their forebears, though the computer graphics backgrounds can't quite live up to the painted versions of the original. For the most part, the camera style is quite restrained, with the exception of a self-conscious camera spiral at the finale that feels rather jarring. Several echoes of the 1942 film are consciously included: for example, Mena (Cree Summer), Bambi's foster mother, almost immediately says the last words that Bambi's mother told him. Also, the trivia track points out that Bambi and Ronno have a junior version of their fight in the earlier picture that is a shot-for-shot remake. The unity with the original is heightened by the liberal borrowing of Frank Churchill's underscore. That emphasizes the jarring nature of the forgettable songs in this version, which have a pop/rock beat, instead of the more classical songs of the original. I suppose we should be happy they refrained from inserting rap and hip-hop. Stewart is majestic as usual as the Great Prince, but the child actors playing the young animals are quite delightful. Alexander Gould also voiced the title character in Finding Nemo, but he's a good match for Donnie Dunagan's voice in the original. Brendon Beorg is quite delightful as the energetic Thumper. On the whole, this is a quite satisfactory little sequel that just tries to bite off a little more than it should. The running time is deceptively long; over seven minutes are devoted to the end credits. This DVD is available only for a very limited time; wholesalers will not be able to obtain any more copies after April 17, 2006 so speedy use of the nearby link is highly recommended. Image Transfer Review: The anamorphic widescreen picture is very attractive on the whole, as it should be for a new production. The linework is quite clean and colors are very vivid. The only shortcoming is some mild compression ringing around the figures. The bit rate is high, however, and despite the length of the feature an RSDL disc is used to allow plenty of breathing space. Audio Transfer Review: First-rate modern 5.1 tracks in both DD and DTS are presented here, with plenty of surround activity, clean dialogue and nice range on the songs and score. Deep bass is plentiful and there's some attractive orchestral reverb in the surrounds. The sounds of nature are highly immersive in all versions, giving the sensation of being deep in the forest. Very nice indeed. Extras Review: It's not a platinum edition, but there are a few worthwhile extras here. Foremost is The Legacy Continues, a 12m discussion with the voice artists, animators and directors that also shows them at work. A 3m:43s featurette called Disney's Sketch Pad includes a Disney artist who shows you how to draw Thumper. There's a game, Thumper's Hurry and Scurry for 1 or 2 players, that is essentially a hide and seek game in the forest. Finally, there's a trivia subtitle track that both discusses the natural world as represented in the film, plus details about the making of the picture itself. It's well worth checking out. A worthy successor that measures up surprisingly well to the original. But act quickly, before it disappears and you're stuck paying five times as much on eBay.